For the greater part of the last decade, Mazda has built a reputation for making premium and fun-to-drive cars at an affordable price point. I found that to be the case when I tested the Mazda 3 and Mazda 6 sedans, but those aren’t the cars that fly off of dealers’ lots. Rather, Mazda has been experiencing the same sort of shift in preference towards crossovers and SUVs as the rest of the automotive industry. 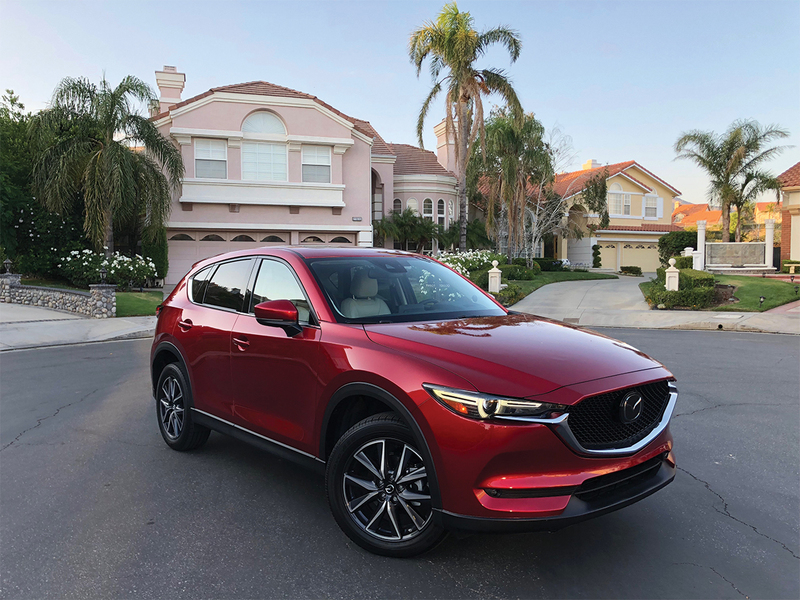 Consumer preference has made the CX-5 crossover Mazda’s best-selling car worldwide and with the outgoing model being lauded as best in its class, the redesigned CX-5 had big shoes to fill. Mazda redesigned the CX-5 in 2017, with the outgoing model being one of the most popular and upscale entrants in an otherwise bland segment of the industry. The CX-5 isn’t the most exciting Mazda under $30,000; crossover buyers, however, rarely choose to buy a crossover for the way it looks or the way it drives but rather with practicality in mind. That being said, the CX-5 exists for the crossover buyer who still wants to enjoy their driving experience. The new CX-5 doesn’t disappoint in that department. The model comes standard with a 2.5 liter, four-cylinder engine making 187 horsepower. This doesn’t make it the quickest horse out of the stable, but the CX-5 isn’t so much about straight line speed. Instead, CX-5’s shining spot lies within its remarkably responsive driving dynamics. The CX-5 now comes standard with Mazda’s G-Vectoring control, a traction assistance system that alters the engine’s timing to make tight corners easier to manage. For drivers, the main change is the more responsive and confidence-inspiring handling. I found the CX-5 to be far more engaging and enjoyable to drive than virtually any of its competitors. For a vehicle of its size, weight and power, this is seriously impressive. Despite being underpowered, the base engine doesn’t disappoint much. Unlike most competitors which have shifted towards the use of CVT (continuously variable) transmissions, the CX-5 still uses a smooth and quick shifting 6-speed automatic. The base inline-4 motor revs fast and provides decent power off the line but tapers off. The CX-5 isn’t the most fuel efficient family hauler, only netting 29 miles to the gallon on the highway and averaging 26 between combined city and highway driving. Mazda did remedy both of these concerns with the newly released 2019 CX-5 which will receive Mazda’s new 2.5 liter turbocharged four-cylinder engine producing 250 horsepower and increasing overall efficiency. Even with class-leading driving dynamics, the interior is where the CX-5 really sets itself apart from the competition. My loaded test car came wrapped with a beautiful, parchment-colored leather interior and the rest of the cabin is adorned with high-quality materials that are all soft to touch. All the interior controls are well-placed and straightforward to use, and the standard 7.0-inch center-mounted screen is operated using a control knob on the center console similar to one that can be found in an Audi or BMW. The whole interior vibe is elegant and upscale, much more so than anything else around this price point. There is plenty of interior space for the driver and the cabin was designed to be more driver-oriented with excellent visibility all around; that being said, however, rear passengers could benefit from a little bit of extra legroom. The CX-5 isn’t lacking on the technology front either. My test car came equipped with a slew of features such as radar cruise control, blind-spot monitor, heads-up display, rear cross traffic alert, lane keep assist and lane departure warning. Some of these features, such as the heads-up display, are even available on several of the CX-5’s competitors and can only be found in cars upmarket. My 2018 model tester was missing one key feature, however, lacking Apple CarPlay and Android Auto integration. Mazda did roll out the software for the 2019 model and other CX-5 owners can bring their vehicles in for an upgrade that includes these features. All in all, the CX-5 really stands in a class above the rest. The fact of the matter is the CX-5 really doesn’t deserve to be in the same conversation as its competitors from the likes of Honda and Toyota when it performs better and feels more upscale than some similarly-sized rivals from Cadillac and Acura. The CX-5 stands to be a premium entrant at a mainstream price and the compact SUV to buy without a doubt. The car used in this review was provided courtesy of Mazda USA.